In a 1998 report designed to train officers for the twenty-first century, the War Ministry of the United States presaged a “volatile, uncertain, complex and ambiguous” world: VUCA, for short. VUCA perfectly describes what is happening in the world of global business today. With the events of 2016 – Brexit, the election of Donald Trump, the threats of terrorists and cybercriminals, climate change – among others, business leaders have entered a new era that requires new ways of leading. Traditional management methods no longer seem sufficient to address the volume of change we are seeing. Businesses do not work as usual. In making decisions, companies are forced to deal with growing uncertainty, complexity and ambiguity in their environments. Faced with this differential challenge with previous times, we can only adapt our organizations to this environment. We need to know what the client wants, how he wants it, and when he wants it. To postpone this decision, it would provoke our expulsion from the market, taken over by the companies most focused on satisfying the client, applying the most appropriate technologies and solutions. Vision: business leaders today need the ability to see through chaos to have a clear vision of their organizations. They must define the true objective of their organization: their mission, values ​​and strategy. They must create clarity around this objective and refuse to allow external events to divert them from the course or make them neglect or abandon their mission. Understanding: with their vision in hand, leaders need a deep knowledge of the capabilities and strategies of their organization to take advantage of rapidly changing circumstances, taking advantage of their strengths and minimizing their weaknesses. Listening only to sources of information and opinions that reinforce your own opinions carries a great risk of losing alternative points of view. Courage: now more than ever, leaders need the courage to face these challenges and make bold decisions that represent risks and that often go against everything. They can not afford to keep their heads down, using traditional management techniques while avoiding criticism and risks. In fact, your greatest risk lies in not having the courage to make bold moves. This age belongs to the audacious, not the meek and timid. Adaptability: If there was ever a need for leaders to be flexible to adapt to this rapidly changing environment, here it is. Long-term plans are often obsolete at the time of their approval. Instead, flexible tactics are required to adapt quickly to changing external circumstances, without altering the strategic direction. This is not the time to continue with the financial engineering that has prevailed in the last decade. Rather, leaders need multiple contingency plans while maintaining solid balance sheets to cope with unforeseen events. It is one of the new visions, to explain the evolution of technology, and its adoption by organizations. It is represented graphically, taking on the y-axis, the “amount of change”, and on the x-axis, “time”. 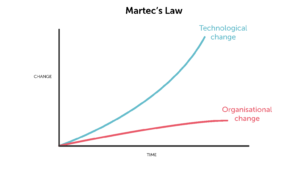 In this Law of Martec, technological advances -see blue line in the graph- progress according to an exponential curve. Therefore, the slope of the curve is increasing, which indicates that the speed of change of the technology increases with respect to the immediately previous time interval. In other words, technology is accelerating, and will continue to do so. However, the change adoption of organizations is logarithmic. Changing an organization, how it thinks and behaves, remains difficult and slow. Perhaps the final question we can ask ourselves is if from Frigoríficos Bandeira we are adopting the necessary technological changes to meet the expectations of our customers, frankly, with much effort and dedication, we believe that YES.